Lock in a great price for Slussen Bed and Breakfast – rated 8.2 by recent guests! 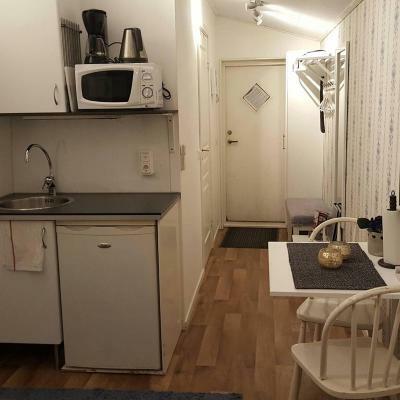 Nice & cosy apartment with Sauna as a bonus. Enough space for 4 for short stay. Effective communication with Annelie, all questions were answered without any delay, thanks a lot. Once we orientated ourselves, it proved to be very central - just 10 minutes walk along the very picturesque river to the centre, the castle etc. Very good place to rest for 3/4 days, the little private court between the buildings is very cute and gives you the possibility to know other people... 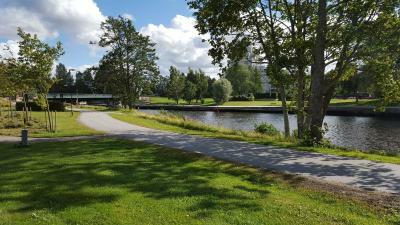 I liked very much that the place is very close to the big park where you can find a lot of wild animals and have jogging or training inside the nature. 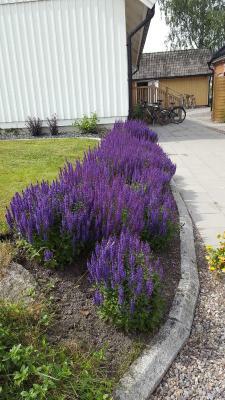 The location is fantastic - close to town, but still nature is right on the doorstep. Location is great because it's close to '0set' and Naturens Hus. And we really wanted be outdoors a lot. 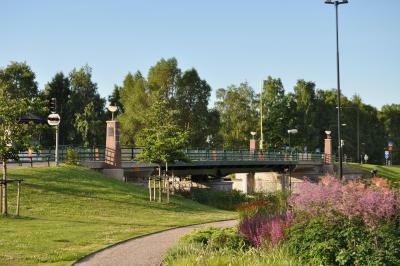 It's approximately a 20-25 minute walk from the city center, so if you're planning on mostly spending your time in the city center it's a bit far without a car. 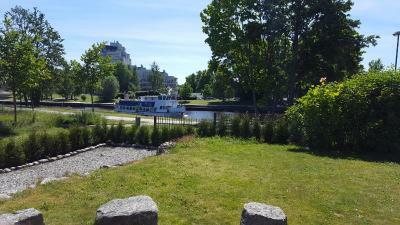 However the walk to city center is a really beautiful walk, through Slussen, Wadkoping and Stadsparken. Another reason to why we chose to stay here is the more homelike feel. I reserved two rooms (1 and 2) and get all that I needed. Very clean and very well cared. The space is very nice. Short walk to the city center and a very nice para on the back. Would return there. Thanks so much for all the help. The host asked what I would like for a vegetarian breakfast. It was really good! Very comfortable place. Breakfast was sufficient and tasteful and gave us enough energy to continue our trip. 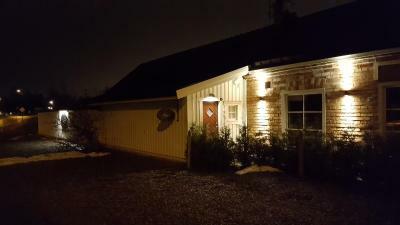 This B&B is by the Svartå River, less than 1.2 mi from central Örebro. 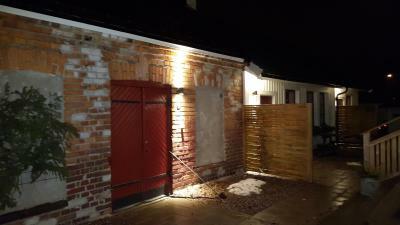 All rooms and studios include a TV and kitchen facilities. Wi-Fi and parking are free. 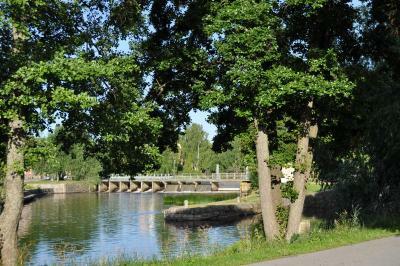 Stadsparken is 1,150 feet away. 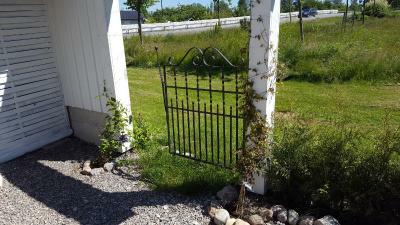 Private entrances, a patio and garden views are standard at Slussen Bed and Breakfast. 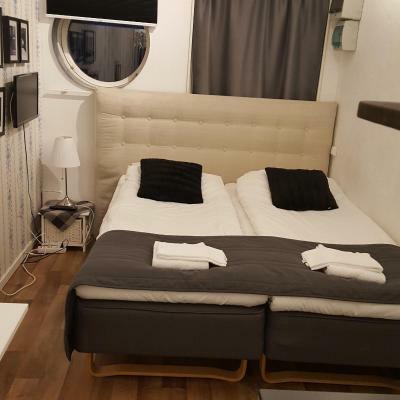 All accommodations includes either a kitchen or kitchenette and a private bathroom with shower. BBQ facilities are found in the garden. 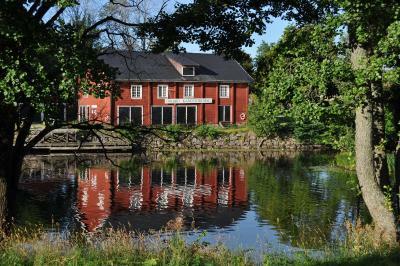 Wadköping, the old town area, is 1,150 feet from B&B Slussen. 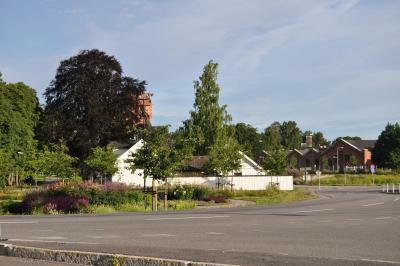 Örebro Central Station is a 10-minute bus ride away, with Slussen Bus Stop found 450 feet from the property. Gustavsvik Water Park is 2.5 mi away. 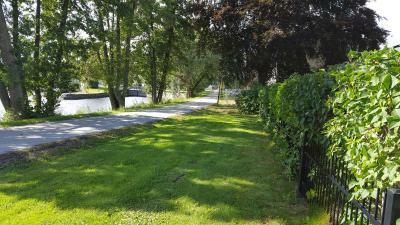 Boat locks on the river can be seen just 350 feet from the accommodations. 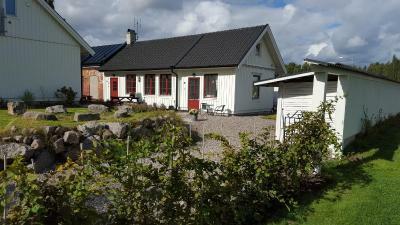 When would you like to stay at Slussen Bed and Breakfast? Large studio with a full kitchen, living room with a TV, as well as a garden-view patio. Please note that 4 guests are accommodated in a sleeping loft, which has a low ceiling. Observe that there is a very steep staircase to the loft. 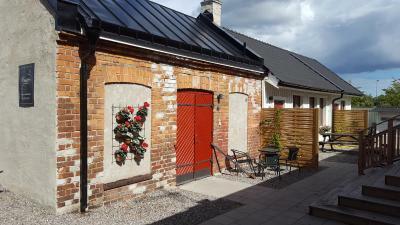 Studio with a private sauna, kitchenette, as well as a TV and patio. Please note that 2-3 guests are accommodated in a sleeping loft. This is only accessible by a steep staircase. Pets cannot be accommodated in this studio. This room has a kitchenette, flat-screen TV and garden-view patio. Please note guests are accommodated in a sleeping loft, which has a low ceiling. This room has a kitchenette, dining area and flat-screen TV. Pets can not be accommodated in this room. 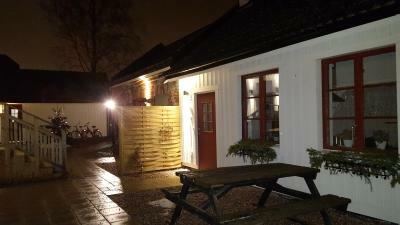 House Rules Slussen Bed and Breakfast takes special requests – add in the next step! 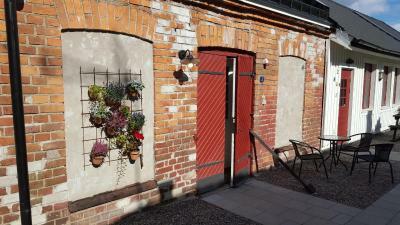 Any additional older children or adults are charged SEK 150 per night for extra beds. Slussen Bed and Breakfast accepts these cards and reserves the right to temporarily hold an amount prior to arrival. Please note that Slussen Bed and Breakfast has no reception. There is no smoking in the garden and in the rooms. Slussen Bed and Breakfast requires that the credit card holder’s name matches the guest’s name on the booking confirmation. Guests are required to show the credit card and a photo ID upon check-in. Please inform Slussen Bed and Breakfast of your expected arrival time in advance. You can use the Special Requests box when booking, or contact the property directly using the contact details in your confirmation. A lot of construction currently going on in the area. If you wish to sleep longer during weekdays this is challenging and construction work starts early in the morning. This place is not a B&B! It is falsely described and the facilities in the room we were in were of a low standard! It operates like an apartment not a B&B - you check yourself in / you don’t get to meet anyone and are not hosted st all / there is basically NO BREAKFAST (unless you arrange in advance for a ‘basic’ breakfast to be left in the fridge). That is not a B&B! The room we had was very cheaply built (like an old garden shed (built as a lean-to on the back of the main building) and then roughly rurned into a bedroom. Very small and feels you’ve been conned into sleeping in a shed! To add insult to an already poor experience, they ask guests to do their own cleaning! How is that a B&B ? It was very good just i didn't like the view of my window, bur anyway next time hope to be more luky. The house has charm and that means that there are some scuffs and scratches. I loved it, particularly as I didn't need to worry about the kids touching things. The unit we stayed in was really really small for 5 nights. Hard to find room for bags and very limited space to hang your clothes. AC very loud. Unit is not as new as pictures show, a bit run down but still clean and neat enough. Next time I would chose one of the other two units that are bigger, or just stay a couple of nights with less luggage. The house for accommodating 2 persons person is too small, even very difficult and no space to open 2 luggages. We were delivered one liter of yoghurt, but kitchen didn't contain suitable plates or cups to share that in smaller dishes?